Stokes pulls Victoria back from the edge of Widow’s Hill, where she believes death will reunite her with her new-yet-late husband. Despondent, she looks for clues in minor things and is convinced that his spirit is calling to her. 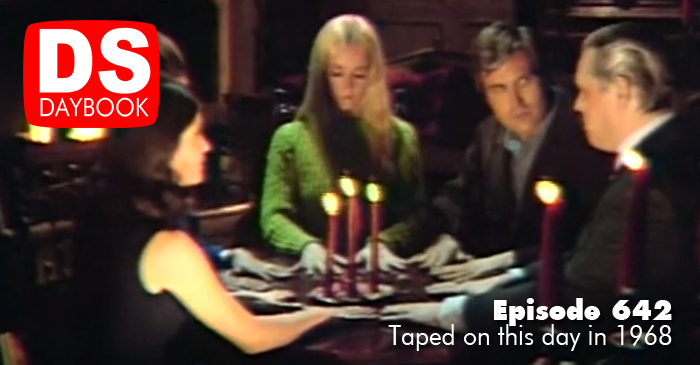 Stokes conducts a séance, where Carolyn is possessed by a spirit named “Magda” who speaks of a curse. It’s arguable that the first era of the show has been over for some time. With the arrival of Betsy Durkin as Victoria Winters, the character takes a fatalistic turn. In cases of terminal illness, there is that period where the sufferer doesn’t appear to be the same person, but rather a shell, going through the ritual of dying. The same with Vicki. Not only is she physically different, she’s despondent to a degree we’ve never seen. It doesn’t help the process of carrying Durkin’s flag. Visitors to the Daybook know that this time of year brings my annual and inarguably unsettling advocacy for her as an addition to the show. Alexandra Moltke is a sentimental favorite… after all, she is one of two characters (alongside Barnabas) who define the series. It’s hard to be the Lazenby in these cases. Poor Betsy gets stuck with sending off the character while denying the audience the cathartic satisfaction of seeing Moltke, herself, climb into the torpedo and blast off to the Genesis Planet. Maybe that’s a good thing. As with Maggie’s exit many years later, the mounting and near-irreversible unhappiness around Victoria makes her exit just as quietly devastating. Soaps thrive on making their characters miserable. Yet, they also have to keep them around as core ensemble members. Thus, we get a moderated and modulated misery. Real consequences are kept for short timers. So, when Vicki tries to jump off Widow’s Hill, herself now a kind of existential widow, and then hurls herself onto the bed at Collinwood in powerless misery, it cuts deeply. It’s clear they’re not going to keep the show going with Durkin as Victoria, and the lack of a B plot to distract the character into a new purpose on the program is just as clear. More than any of this, seeing Moltke’s Victoria experiencing a sense of despair only slightly deeper than the Mariana Trench is an overwhelming prospect. In a move that would get them ample letters, today, Stokes accidentally advocates suicide as a guarantee that the lovers will be reunited. Bad idea, because to Vicki, that’s not just preferable to what she’s experiencing now, it’s preferable to anything she might ever experience. There is horror and then there is the unthinkable, and putting characters and audiences through the latter can be the definition of cruelty. Dark Shadows goes there at times, but it wisely stays on the audience’s side. With Durkin as Vicki, they have it both ways. This episode also finds Stokes emerging to his greatest extent, perhaps to warm up for the war on Quentin. As important as are his moments of expertise, this episode takes great care to show his shortcomings as well. It’s a canny balance, especially because he continues to win the audience by admitting when he misfires. There is a life lesson in this. Few boast more than Stokes, and this would be insufferable were it not the result of total honesty. When he boasts, notice that he never exaggerates; he reports. And he is just as straightforward when describing mistakes. As invested as he is in the occult, he’s refreshingly understanding about Chris’ skepticism. The evidence will take care of it, and prior to that, Chris is respectable for putting common sense and empiricism, first. Stokes is capable of massive (as Isaac Asimov put it) “cheerful self-appreciation.” At the same time, he has no ego to bruise. Yet more ways the Great Professor is our highest guru here at the CHS. Perhaps the most arresting thing about this episode comes at the very end. Dark Shadows is as much a ritual as the séances, rites, and trials it depicts. Part of that ritual is The Cliffhanger. This episode ends on a far more contemplative note. After Carolyn introduces us to Magda via a very invasive possession, Chris stops the working and breaks the connection, much to Stokes’ consternation. She’s spent, he holds her, and there is no cliffhanger. Just a moment with the two characters seeking solace with one another as Collinwood’s autonomy reveals newfound powers and threats. It prepares us for the rich mythology of 1897, building on the hidden world with which they’ve coexisted for nearly 650 episodes. 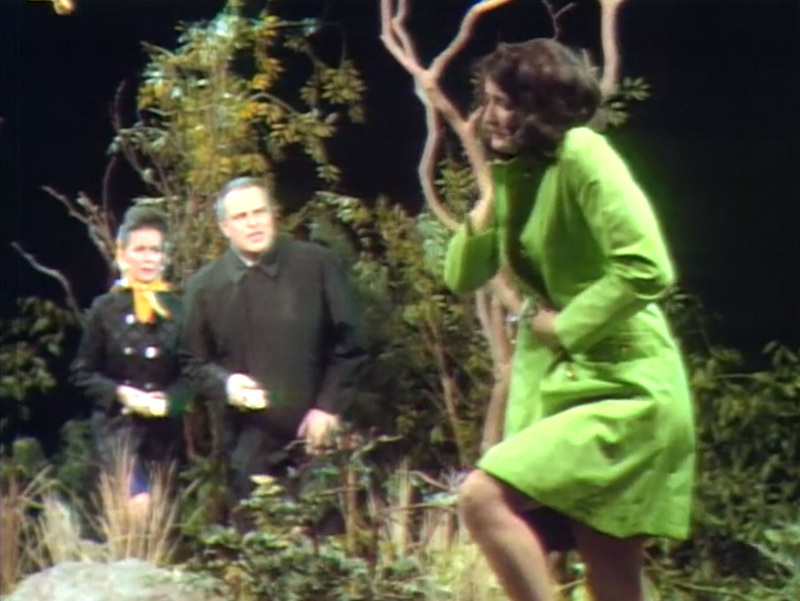 This episode was broadcast Dec. 10, 1968.